TORONTO, ONTARIO–(Marketwired – Feb. 19, 2015) – Continental Gold Limited (TSX:CNL) (OTCQX:CGOOF) (“Continental” or the “Company”) is pleased to announce results for 20 diamond drill-holes through the eastern Yaraguá vein system at the Company’s 100%-owned Buriticá project in Antioquia, Colombia. Drilling continues with the goal of upgrading Inferred resources into the Measured and Indicated categories under National Instrument 43-101 (“NI 43-101”) guidelines, and delivering overall robust mineral resource growth. The Company recently released a Preliminary Economic Assessment (the “2014 PEA”) of the Buriticá Project. 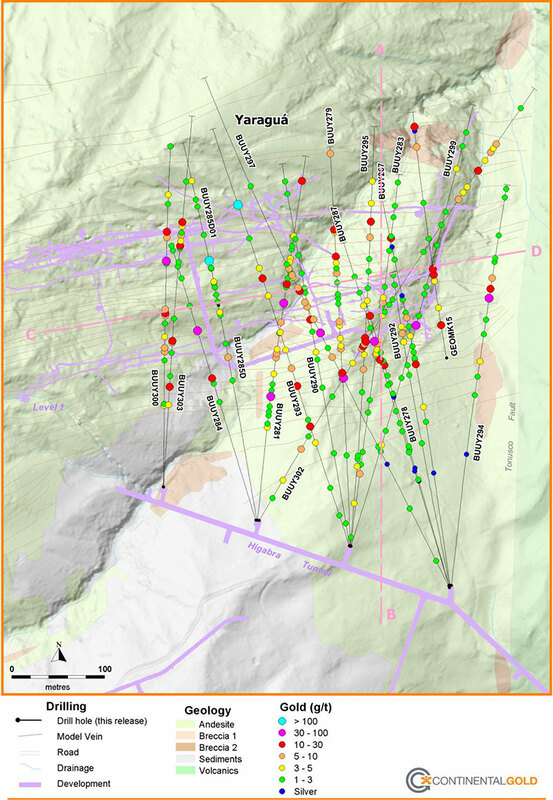 The 2014 PEA (entitled “Buritica Gold Project, NI 43-101 Technical Report Preliminary Economic Assessment, Antioquia, Colombia”, and dated December 22, 2014 with an effective date of November 17, 2014) is preliminary in nature and includes inferred mineral resources that are considered to be too speculative geologically to have the economic considerations applied to them that would enable them to be categorized as mineral reserves, and there is no certainty the 2014 PEA will be realized. Further, mineral resources are not mineral reserves and have not demonstrated economic viability. Drilling, largely at near true width angles to the vein domains, was successful in extending and infilling sections of the eastern Yaraguá vein system through more than 400 metres of vertical and 350 metres of lateral extents. 2.65 metres @ 21.5 g/t gold and 21 g/t silver (GEOMK15, MU1, elevation of 1,484 metres). These and other intercepts in the 1,000-1,400-metre range of elevations will contribute to increased confidence levels of high-grade gold and silver mineral resources within the master veins located in eastern Yaraguá. The grade X thicknesses of these veins are particularly encouraging as this area is proximal to the main haulage developments proposed in the 2014 PEA and more importantly restricted the influence of an area within Yaraguá that was previously modelled as containing predominately low to medium precious metal grades. 0.5 metres @ 30.7 g/t gold and 235 g/t silver (BUUY302, elevation of 1,127 metres). These and other extensions of the Yaraguá system shown in Table 1 are all in proximity to mining development proposed in the 2014 PEA. Most of the vein families in Yaraguá east remain open to depth and grades encountered in this area are encouraging for resource growth. Continental’s 100%-owned, 62,348-hectare project, Buriticá, contains several known areas of high-grade gold and silver mineralization, of base metal carbonate-style (“Stage I”) variably overprinted by texturally and chemically distinctive high-grade (“Stage II”) mineralization. The two most extensively explored of these areas (the Yaraguá and Veta Sur systems) are central to this land package. The Yaraguá system has been drill-outlined along 1,100 metres of strike and 1,700 vertical metres and partially sampled in underground developments. The Veta Sur system has been drill-outlined along 1,000+ metres of strike and 1,800 vertical metres and has been partially sampled in underground developments. Both systems are characterized by multiple, steeply-dipping veins and broader, more disseminated mineralization and both remain open at depth and along strike, at high grades. See “About Continental Gold” below for a précis of the 2014 PEA prepared in accordance with NI 43-101. This release documents the results of infill and extension drilling through the Yaraguá vein system. Significant new drill intercepts are listed below in Table I and are referenced in Figures 1, 2 and 3. * Intercepts calculated at 1 g/t gold + 50 g/t silver cut-off grades for minimum intervals of 0.5 metres, with up to 30% internal dilution. True widths not accurately known but generally are between 70% of the down-hole interval and near true width (for GEOMK15, about 50%). Drill-holes designated “BUUY” were collared from underground, and drill-holes designated “BUSY” were collared at surface. Holes directionally-drilled from “mother holes” (BUUYDxxx or BUSYDxxx) are designated BUUYxxxDxx or BUSYxxxDxx), as the case may be. ** Intercepts in vein domains are respectively nominated by vein code (e.g. VNC) whereas other intercepts are designated as below or outside of the current Yaraguá mineral resource envelope. Intercepts with grades X thicknesses apparently significantly greater than for the corresponding vein domains in the current mineral resource block model are also highlighted in bold. 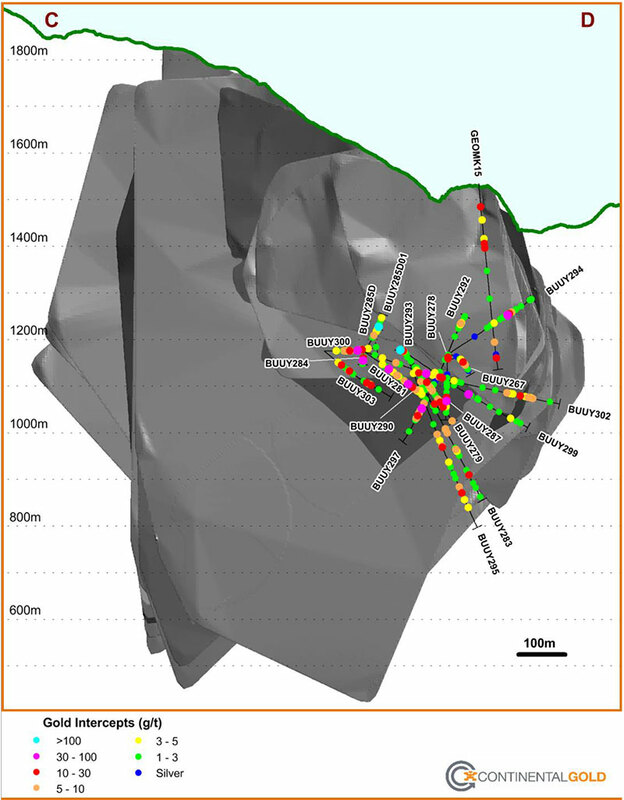 Infill and extension drilling of eastern Yaraguá comprised four fans (for 19 underground drill-holes) drilled from chambers set up in the Higabra tunnel, at around elevation of 1,170 metres (Figures 1 and 2). Drill-holes were broadly north-directed and shallowly inclined to achieve very high angle intersections with master vein sets through most of the Yaraguá vein families. Unfortunately, planned drilling from the eastern-most chamber in the Higabra tunnel was not completed due to high water inflows causing holes to terminate before hitting planned targets. However, these holes successfully dewatered broad areas of eastern Yaraguá. A geomechanical hole (GEOMK15) was drilled from surface, primarily for geotechnical purposes, but also infilled parts of the Yaraguá system at higher elevations than the underground holes. 1.35 metres @ 10.6 g/t gold and 42 g/t silver (GEOMK15, MU2, elevation of 1,396 metres). These and other intercepts in the 1,000-1,400-metre range of elevation will contribute to increased confidence levels of high-grade gold and silver mineral resources in master veins of eastern Yaraguá. The grade X thicknesses of these veins are encouraging for future development of an area that is located close to proposed stopes and main haulage developments outlined in the 2014 PEA. Drilling has been successful in limiting areas of several vein families that have previously been modelled to contain low to medium gold grades. These and other extensions of the Yaraguá system shown in Table 1 are all in proximity to mining development proposed in the 2014 PEA. Most of the vein families in Yaraguá east remain open to depth and grades encountered in this drilling are encouraging for mineral resource growth in this area. Continental Gold Limited is an advanced-stage exploration and development company with an extensive portfolio of 100%-owned gold projects in Colombia. Spearheaded by a team with over 40 years of exploration and mining experience in Colombia, the Company is focused on advancing its high-grade Buriticá gold project to production. On November 17, 2014, the Company announced the 2014 PEA, the results of which included an 18-year mine life based on 20,055,000 tonnes grading 7.80 g/t gold and 19.35 g/t silver, resulting in 4,777,000 ounces of recovered gold and 7,088,000 ounces of recovered silver, and utilized the May 2014 mineral resource estimate prepared in accordance with NI 43-101. The 2014 PEA concludes an after-tax net present value at a 5% discount of $1.08 billion and an after-tax internal rate of return of 31.5% on an initial capital cost of $390.3 million with a payback of 2.8 years. In August 2012, Continental achieved an important milestone, receiving formal approval for the modification of its existing Environmental Impact Assessment. The amendment allows the Company to build a six-kilometre switchback road and begin underground development by constructing a one-kilometre access tunnel. With a goal of being the newest hard rock gold producer in Colombia, Continental has achieved major advances with the access tunnel, which is providing access for underground drilling and will eventually be used for commercial production. A Phase VII drill program is underway at the Buriticá project to further delineate mineral resources and drill new target zones identified within its concessions. Figure 1 – Plan view of highlights of new drilling in eastern Yaraguá, showing the surface projection of veins in the current (2014) Yaraguá mineral resource model on geology-topography. Line A-B refers to the cross section line for Figure 2, and line C-D to the long section line (Figure 3). Figure 2 – Cross Section (line A-B on Figure 1) showing highlights of new drilling against the grades of veins from the 2014 Yaraguá mineral resource block model. 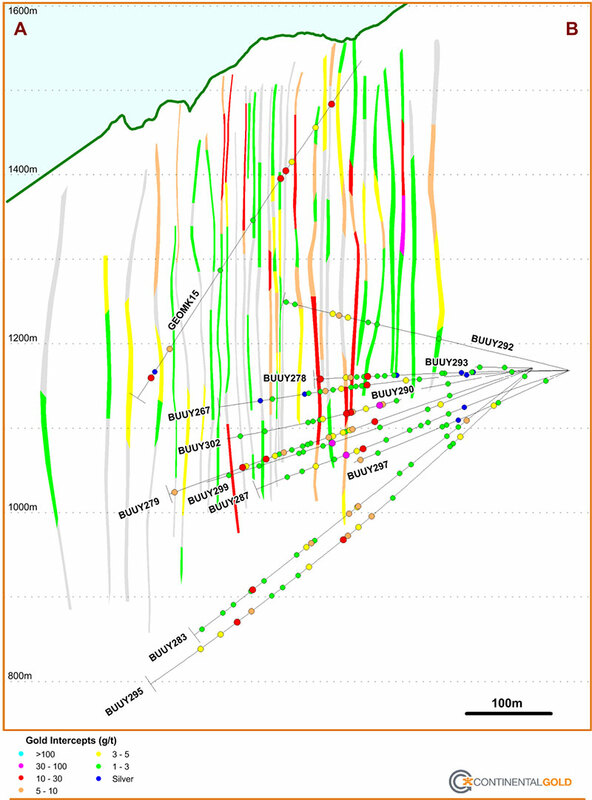 Figure 3 – Long Section (line C-D on Figure 1) showing highlights of new drilling against the outlines of the 2014 Yaraguá mineral resource envelope.